Panasonic Corporation, Japanese multinational electronics corporation counted among one of the top leading pioneer serving in electronic industry worldwide has unveiled its plan to to launch their first smartphone in the country. This new element will be launched by the company on May 16,2013 as per the details revealed in its official TV commercial. This new element is named as, “Panasonic P51” which will introduced in the Quad Core segment of Smartphones. In recent times, we witnessed a tough competition in the quad core segment among all the manufacturer’s across the globe and now the same race course will soon get a new rider to compete in as Panasonic. Earlier, the leading top brand holders like Samsung, Sony, LG and many more introduced their extremely powerful devices in the high price segment which was specifically targeted for premium segment of buyers. However, many other new brands also launched new powerful devices to compete against those high end premium devices with an affordable price range which helped customer to grab them at comparatively lower prices. And now to continue this legacy, Panasonic has come up with this new device and as per the rumors the device will be also introduced in a budget friendly price segment. Though Panasonic India haven’t listed this smartphone either in its Official website or anywhere else but received information about this phone in the TV Commercials those are being now aired during the IPL (Indian Premier League). Getting a glance towards its available specifications, though all the details are yet to be revealed but in terms of frame up, Panasonic P51 sports a 5 inch of IPS LCD touch screen display with 720p resolution. With 5 inch of screen size, this phone will be considered as phablet. In terms of power, the device is powered with a Quad Core processor at a clock speed of 1.2 GHz. It could be either MediaTek MT6589 or Qualcomm MSM8225 Snapdragon S4 Play as full details are not yet available. In terms of image optics, it houses a primary camera rated at 8MEGAPIXEL. Other features of camera are yet to be revealed though we can assume the device dubbed with auto focus camera with LED flash for low-light capturing. 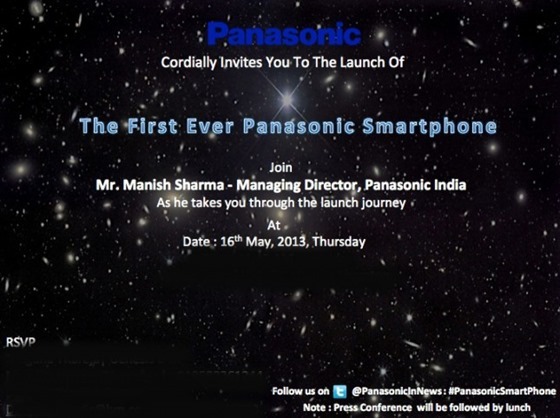 As per the company release date of Panasonic P51 is on 16 May 2013. For more information, Stay tuned with us.